MKVToolNix 30.0.0 was released today with new features, enhancements, and bug-fixes. Add button to show the 10 most recently used output directories. Predefined split sizes and durations can now be customized in the preferences. Add option to append chapters from an existing file to the current open editor tab. Add new context menu action to copy selected entry to another open editor tab. And more other changes, see the release note for details. Replace $(lsb_release -sc) with bionic for Linux Mint 19, or xenial for Linux Mint 18.x. And input your password (no asterisks while typing) when it prompts and hit Enter. To remove the apt repository, launch Software & Updates utility and navigate to Other Software tab. 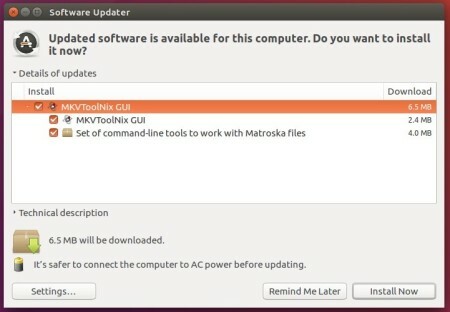 MKVToolNix 26.0.0, free and open-source Matroska software, was released a day ago with new features, enhancements, and various bug-fixes. generated for the chapter atoms. name template if one is set via --generate-chapters-name-template. restores the widths set by the user. chapters will be generated without names. to the “additional modifications” dialog. The official apt repository offers the latest packages for Ubuntu 16.04, Ubuntu 18.04, Linux Mint 19/18, and their derivatives. To remove the repository, launch Software & Updates utility and navigate to Other Software tab. MKVToolNix 24.0.0, free and open-source Matroska software, was released 2 days ago. Here’s how to install it in Ubuntu 18.04, Ubuntu 16.04, Ubuntu 17.10.
mkvmerge: MP4 reader: improved the detection of edit lists consisting of two identical entries, each spanning the file’s duration as given in the movie header atom. mkvmerge: JSON identification: the “display unit” video track property is now reported as ‘display_unit’. Updated Niels Lohmann’s JSON library to v3.1.1. Updated pugixml library to v1.9. The official apt repository offers the latest packages for Ubuntu 16.04, Ubuntu 17.10, and Ubuntu 18.04 so far. Replace $(lsb_release -sc) with xenial for Linux Mint 18.x. And input your password (no visual feedback while typing) when it prompts and hit Enter. 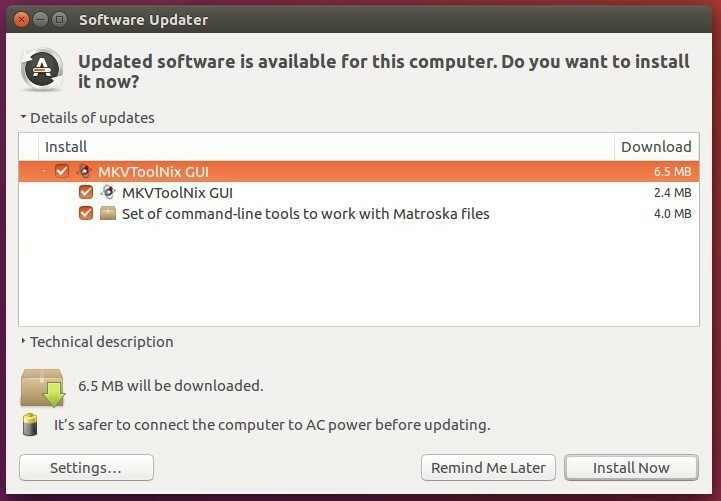 Free and open-source Matroska software MKVToolNix v21.0.0 was released days ago. The biggest change is that mkvinfo’s GUI portion has been removed. MKVToolNix GUI: an “info” tool has been added, replacing the functionality of mkvinfo’s GUI. The functionality is not on par yet but will be for release v22. For the bug-fixes and other changes, see the release note. The official apt repository offers the latest packages for Ubuntu 16.04, Ubuntu 17.10 so far. MKVToolNix, free and open-source Matroska software, reached 20.0.0 release a day ago. Here’s how to install it in Ubuntu 16.04, Ubuntu 17.10. MKVToolNix 20.0.0 fixed quite a number of bugs in mkvmerge, and removed those options and features deprecated a year ago. An important change was the near complete rewrite of mkvinfo’s internals. Several element names are a bit clearer (e.g. Maximum cache instead of MaxCache). All timestamps and durations are now output as nanoseconds in formatted form (e.g. 01:23:45.67890123). All additional formats (e.g. floating point numbers output in seconds or milliseconds) were removed. Element names for chapters and tags are now translated if a translation is available. Elements located in wrong positions within the Matroska document are handled better. The official apt repository offers the latest packages for Ubuntu 16.04, Ubuntu 17.04, Ubuntu 17.10 so far.